I like it! I have noticed it is slowly losing its suction. I keep it clean, but it worked better when it was new. You can have spotless clean carpets and floor with absolutely no effort! Let this new-generation robot vacuum do the work. The UV-C Sterilizer Robot Vacuum Cleaner with HEPA Filter and Wet Mop is an all-in-one solution that sweeps, vacuums, sterilizes and mops. For pet owners, or anyone who wants a clean and hygienic home, this is the easy way to clean pet fur, dust, and other allergens from carpets, tile, hardwood, laminate and more. How it works: dual spinning brushes sweep dust and debris from the floor and hard-to-reach corners into the suction inlet. As the vacuum pulls in dust and debris, the HEPA filter traps The UV-C sterilizing light then passes over the vacuumed carpet or floor to kill microscopic germs and bacteria. Finally, the wet mop trails behind to give your hard-surface floors that final touch. You get fresh, clean carpets and floors and a healthier, more hygienic home with absolutely no effort. 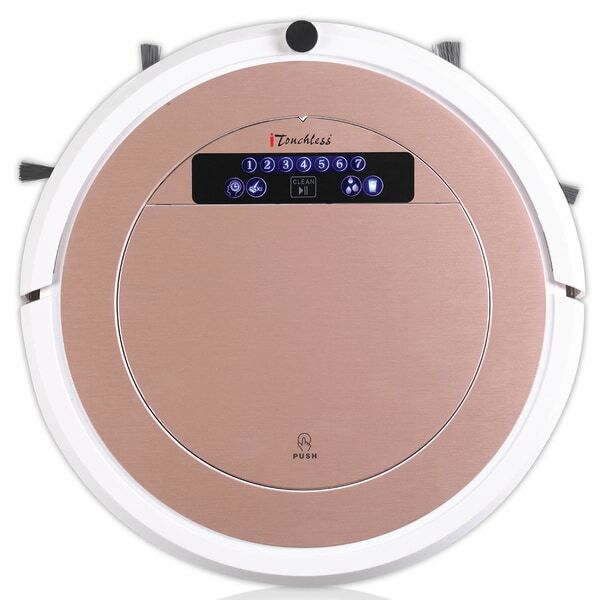 This robotic vacuum cleaner has a lot of other premium features, like: stronger 1.2 kPa motor, quieter (<50 dB) operation, automatic return to and charging at charging station when the battery is low, 5 pre-set cleaning modes, anti-fall and anti-collision sensors, an extra-large 900 ml dustbin that requires less frequent emptying, low-profile design (less than 4� height) that allows it to clean under sofas, voice alerts, a remote control that offers one-button control, and an attractive rose gold finish. This works great on all floors, such as laminate and carpet. We have used in both. It vacuums and wet mops. It's just a little loud, but to avoid the tasks I can stand the noise. I plan on updating this later if possible after using it for a while. But my initial impressions after owning this for about two weeks is that it’s sturdy, it easily navigates the first floor and it’s substantial enough to truly to a good job. It is larger than expected so I’m not sure how corners and under cabinets will work but so far, so good. Bonus points for the cute rose gold color and the entertainment value to kittens. Works well easy to operate and best price with more features.